Many companies are not single businesses but a collection of businesses with one or more levels of corporate management. 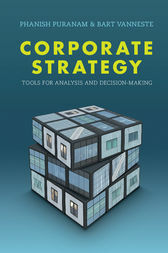 Written for managers, advisors and students aspiring to these roles, this book is a guide to decision-making in the domain of corporate strategy. It arms readers with research-based tools needed to make good corporate strategy decisions and to assess the soundness of the corporate strategy decisions of others. Readers will learn how to do the analysis for answering questions such as 'Should we pursue an alliance or an acquisition to grow? ', 'How much should we integrate this acquisition?' and 'Should we divest this business?'. The book draws on the authors' wealth of research and teaching experience at INSEAD, London Business School and University College London. A range of learning aids, including easy-to-comprehend examples, decision templates and FAQs, are provided in the book and on a rich companion website.